Airlifting of Mansarovar pilgrims became necessary this year as the trek route to Gunji which was badly damaged in a natural calamity could not be repaired in time. PITHORAGARH: Prolonged bad weather and a damaged trek route took a toll on the Kailash-Mansarovar pilgrimage this year with more than half a dozen pilgrims returning midway through the yatra and nearly one thousand mule operators and porters losing their seasonal jobs. Seven pilgrims had to return after waiting for the weather to clear so that choppers meant to ferry them from Pithoragarh to Gunji base camp could take off. The 10th batch of pilgrims had to wait for ten days at a stretch for the weather to clear to be ferried in IAF choppers from the Naini-Saini airstrip to Gunji, the last base camp on way to the Lipulekh Pass through which they cross over into Tibet. Kumaon Mandal Vikas Nigam (KMVN), the nodal agency for the Yatra, even had to write to the External Affairs Ministry requesting it not to send fresh batches of pilgrims after the 11th batch until the backlog of pilgrims waiting at different base camps and rest houses was cleared. Airlifting of Mansarovar pilgrims became necessary this year as the trek route to Gunji which was badly damaged in a natural calamity could not be repaired in time, KMVN GM TS Martolia said. 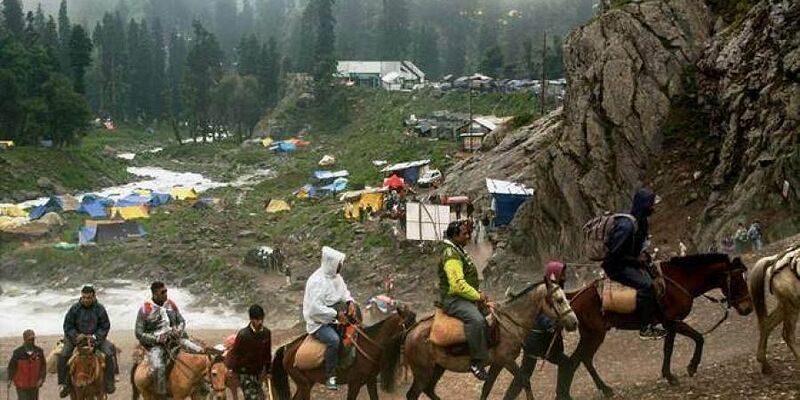 Pilgrims, who returned after successful completion of their Yatra, said the trek route is always preferable as helicopter sorties are heavily dependent on the weather which is usually bad in the region during monsoon. "Several batches of pilgrims got unexpectedly delayed on way to Gunji. Tired of waiting for the weather to clear for several days some had to withdraw midway," the yatra in-charge at TRC Pithoragarh Dinesh Gururani said, adding that the weather has often been bad since June 15. The trek route to Kailash-Mansarovar could not be continued after the first batch due to heavy landslides at Nazang on way to Gunji from Dharchula. "It was a decision of the Government of India to send Kailash pilgrims by IAF choppers from Pithoragarh to Gunji for their safety as the trek route was not in usable condition," Martolia said. Nigam officials said there was no alternative available this year but the KMVN has always preferred the Yatra to be carried out through the trek route as it is not only less dependent on weather but also gives jobs to thousands of villagers every year. "It was an essentially alternative arrangement this year, otherwise the Yatra is good from trek route as it gives seasonal jobs to porters, horse and mule owners, wayside shopkeepers, souvenir sellers and several others in villages along the trek route," said Martolia. Nearly one thousand porters, mule and pony operators and local craftsmen run their trades along the 57 Km stretch between Lakhanpur to Lipulekh during the Yatra season and the earnings take care of them throughout the year. Due to the absence of trek route this year the Nodal agency had to "abandon" over 225 pilgrims who had booked for Chota Kailash at Jolingkong inside Indian territory. "We have incurred heavy losses in abandoning the Chota Kailash Yatra this year due to damaged track route", Martolia said. The pilgrims of the 10th batch, who had to wait for 10 days waiting for clear weather on Pithoragarh to Gunji air route, even demonstrated last week at Naini Saini airstrip demanding that the Yatra be conducted through the trek route. "The Government should have taken extra care to ensure that the trek route was repaired in time to avoid such long delays in Yatra," said Pradhumn Singh Rana, member of the 10th batch who led the demonstration. Roshan Lal Sharma, liaison officer of the 9th batch that reached Pithoragarh after waiting 13 days at Gunji on August 9 said, "Had the Yatra been by trek route the pilgrims could have witnessed the beauty ofterrains fromm Pithoragarh, Didiihat, Dharchula to villages of Vyas and Chaundas valley". "The air lifting also deprived pilgrims of the pleasure of visiting places described in Manas Khand of Skand Puran which form part of the traditional route to Kailash Mansarovar," Sharma said.